What lovely fabrics! I have yet to try Oakshotts but definitely would love to! I especially love that fat 1/8th bundle, but would gladly use either - most likely in a quilt! I've not tried them yet, but I've been watching the wonderful creations others have been using them for with a touch of jealousy. I would use them to make some pieced pillows, as I think they look so luxurious. And I've never used Oakshott, since they're not readily available over here yet. I'm jealous of everyone who does! Those colours look amazing! I've never sewn with Oakshott before, but I sure would love the chance to try them out. I don't know what I'd use them for and I'd probably just admire and pet them for a while before deciding. Thanks for the chance to win. I've never used Oakshott cottons, but that Lipiari bundle is gorgeous! That would be my first choice, but the Colourshotts look beautiful too! They are beautiful, aren't they? I have used them and love them. I'd be happy with either one, and would have to think of the perfect project before daring to cut them! and I follow your lovely blog! I've never sewn with Oakshotts but would love to use the Lipari bundle in a quilt for my husband. The black warp makes it look quite a manly fabric. I already get the Oakshott newletter. And I already follow your blog with Bloglovin. I have never used Oakshott fabrics, but love their appearance! I would prefer the Lipiari - wouold love to make a table runner using them. Signed up for the Oakshott newsletter! I receive their email newsletter! BEAUTIFUL FABRICS! I'D SELECT THE NEW OAKSHOTT LINE! Yum yum! Yes I have tried Oakshott - the shine and shimmer is delicious. I like to use spray starch when I sew with them. I haven't used them, yet, but really enjoyed seeing other's projects using them. I would probably use them for a quilting project - maybe something smaller like a wall-hanging or table runner, that way I could enjoy them all the time! I am an Oakshott newsletter receiver! I've never used Oakshotts before, but have wanted to! I'm so pleased that we can now get them in the US and would love to make a quilt I've had my eye on that would be perfect for the new Colourshotts! They look so wonderful and the colors amazing! I have never used Oakshott before, but would love to try them. I would probably be more likely to use the 10 inch squares as the colors would go better with my stash. That said, I would probably have to see them first and pull from my stash to compliment them, and then they would become a quilt of some sort, or perhaps some more pillows. I have never even seen Oakshott in person but I would love to try it because I drool every time I see photos of it online! I signed up for Oakshott's email newsletter. Layer cake fabrics look great. Would use them along with other fabrics in my current quilt! I subscribe to the oak shot newsletter. And I follow your blog in the old reader. Thanks. I have never had any Oakshott fabrics. My top choice if I should be lucky enough to win would be the Lipiari shot cottons because they are so different from anything I have. I would love to use them in some of the lap quilts I am working on for Christmas gifts. I get the Oakshott newsletter. I've not used Oakshott (or any) shot cottons before but I've totally lusted after them for a long time. 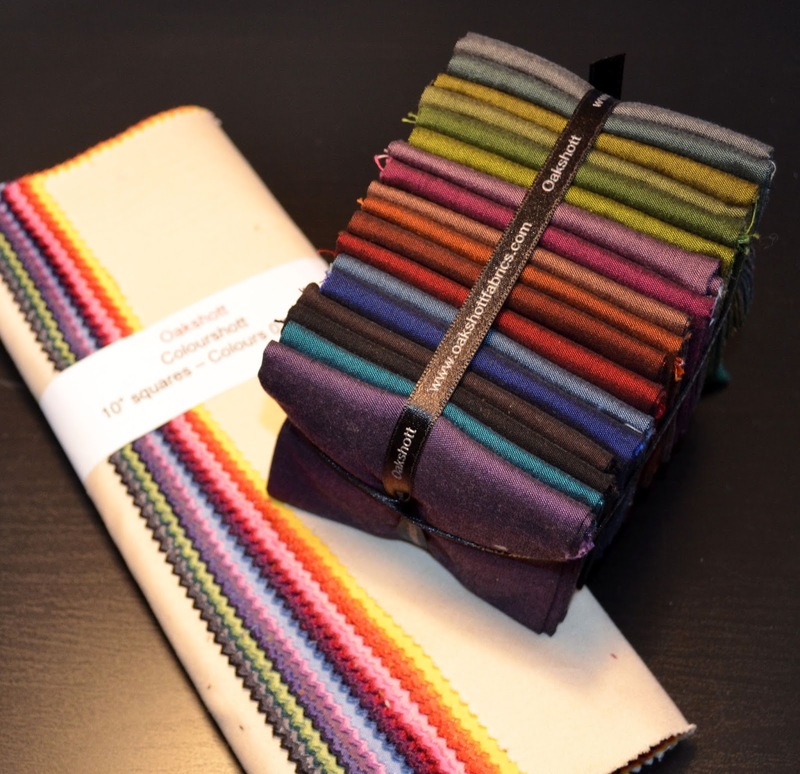 I love both prizes but my preference would be for the layer cake fabrics - I'd love to do something to take advantage of the spectrum of colors. Oh yes, I have followed for some time, nowadys via Feedly. 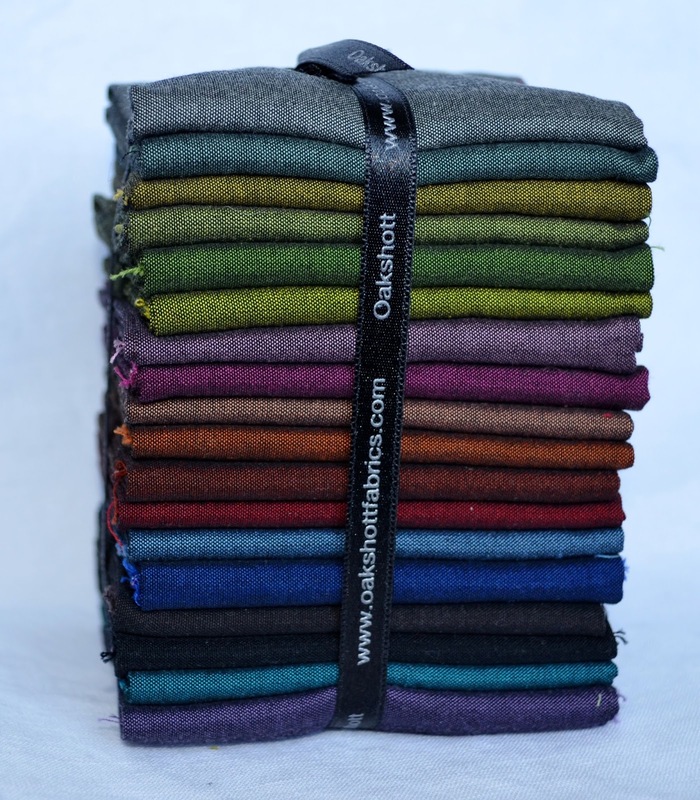 I have not used Oakshott fabrics yet, but, they are gorgeous and would love to try them. The fat 1/8's would be a great start to a "star" quilt. I just love the stars that you made. I love the colourshott 10" squares. I've seen Oakshott cottons at a few quilt shows and drool over them (not literally!) every time. As for what I would make, honestly I'm not 100% sure. My dinette area needs a new wall hanging and these would work really nice! Guess I've decided! I have not tried them yet but have wanted some Oakshot for quite some time! Such rich lovely colors! I love that layer cake. I'd love to make a shrunken-down scrappy trip around the world table runner. And i already receive the Oakshott newsletter. Aren't these fabrics gorgeous! I have signed up for their newsletter. Thanks! id love the Oakshotts. havent used them, but really really want to. i use solids in a big portion of my sewing...thanks fo ra chance. I have some fat eights in red for a Valentine quilt, which of course, isn't even started. LOL! I have not used Oakshot before, but I would like to try them. I think I would choose the 10" squares, because they are a little brighter. I do like the darker tones in the fat quarters, but more for fall or early winter. Now I'm ready for brighter,springier colours. I have never used Oakshotts before but would love to win the fat eights of Lipiari shot cottons. I think these would make a lovely quilt for my couch. I have signed up for email updates from Oakshott Fabrics. I've done the first two, and I already follow you by bloglovin and email. I'd love the chance to work with these fabrics. I'd use the 10" squares for a lap quilt for my sister. Thanks for the chance to win either. If these shine more than in your photos they must be lovely! I'd love the Oakshots - don't know what I'll do with them. I'll just have to wait for inspiration. Thanks. I've never tried Oakshotts but I love working with solids, so I would make a solid quilt with them. I'd be happy with either prize. thanks for the chance. i have never used oakshotts but i would love to try them! I already follow you via email. Thanks. I've never even seen Oakshott fabrics up close and personal, but they look beautiful in photos even though they don't show the full depth of colour typical of the (generally handwoven) shot cottons that I have seen. I love drama of the liparis, but the colours in the layer cake look so intense and vibrant. If I were lucky enough to win, I'd be happy to have either. Whichever, it would be made into a lap quilt for my sewing room. I have a small daybed in there, and it's often the only sunny spot in the house in winter, so I can generally be found there doing handwork. I like the idea of a cocktail dress though. Thanks for the chance to win. I already get the Oakshott newsletter. Thanks again for the chance to win. And, I follow your blog on feedly. I have not used them yet, I would love either but lean towards the layer cake, and I'm not sure what I would use them for. Would like to get them and feel of them and pet them and think on it for a while! I've used shott cottons before but not Oakshott. I just finished a class using hexagons (I used the shott cottons in a place mat) and would use the fat eights for a runner. I signed up for their newsletter and I follow your blog. Take care. I have never used Oakshott, but would LOVE to give them a try! The colors are just beautiful! Of course I would love the fat eights, but the layers cake would be wonderful also to try such beautiful fabric. Thank you for the chance to win! I follow you, Leannne. And I'd luv to follow you down this particular fabric trail. I do get the newsletter as I am itching to try Oakshott fabrics. I haven't used Oakshott fabrics yet, but I have heard a lot about them. Both of the giveaways are great but I think I would use the fat eighth bundle to make a new quilt for my bed. Thanks! IF I won, I think I'd chose the 10 inch squares because I am fixated on 12 monthly wall hangings and these smack of Easter to me. The other set I'd do a fall or winter theme and I'm really trying to think SPRING! I don't think I have ever used their fabric..so that being said I would really love either, the F8 being my first choice simply because the colors are so dark and beautiful! I haven't used them yet. I think I would prefer the later cake but either would be great. I wasn't too make a wall hanging for my living room. I have never used the Oakshott shot cottons before, but I long to try! The colors look so delicious! My first choice would be the fat eight bundle, and it would turn out to be a luxurious table runner. 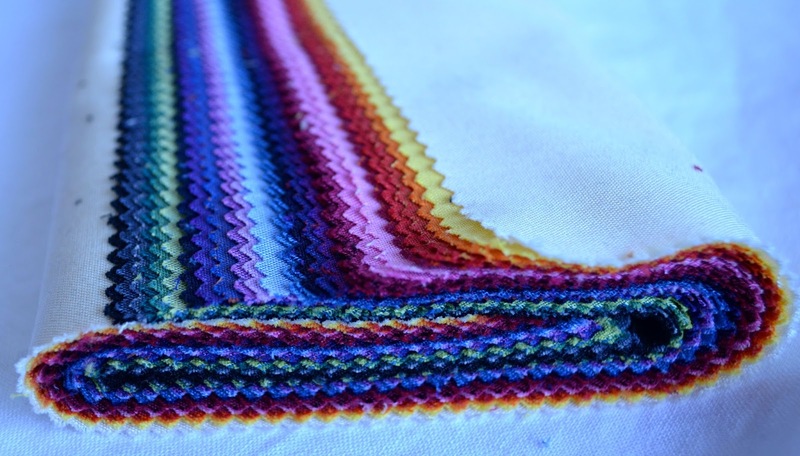 But, the colors of the layer cake bundle are also tempting! I haven't used shot cottons, but thanks for the explanation of what they are. I love fabric that "moves" I'd love to make a quilt for my Mom and Dad with the Fat Eighth bundle. I've been looking for something like this. Thank you! I haven't used shot cottons YET, but I've been wanting to! Both bundles are equally gorgeous; I have no preference for one over the other. I would definitely use them to make a bed-size quilt. I have subscribed to Oakshott's newsletter. I subscribed to Oakshott's newsletter. I am a follower, using Feedly. I've never used oakshott fabrics, but they are soooo yummy! I would love to win this incredible bundle. I would love a chance for either bundle, but if pushed to choose, I think the colors of the Colorshott work best with my existing stash. I have used shot cottons before, making a series of placemats, mixing with linen. Love the saturated colors of these oak shots! I now am receiving their newsletter! Pick me, pick me! Love the oakshot colours. Beautiful. I have never worked with oakshott cotton. I haven't used Oakshott fabrics yet. I would love the layer cake and use in a quilt. I already get the Oakshotts Newsletter. I am a follow with bloglovin. I used Oakshott fabric in my last quilt and was very pleased with the results. I'd love to win the Fat Eighth bundle to mix in with my Kaffe Fassett fabric. I've never used oakshot fabric before either. If I won I would use the fat eighth bundle to create godet's in a denim skirt! I think they'd look splendid! These are some gorgeous looking fabrics! I've never (yet) used Oakshott but would like to! Both prizes are beautiful! If I had the layer cake, I'd make something simple, maybe a postage stamp throw with some stash fabrics mixed in. If I had the fat eighth bundle, ooh, I have a yard of linen that would go great with those . . . I have not used Oakshott yet but I would love to try with the new color line! Thanks. I've just signed up for the Oakshott newsletter! I used a charm pack of them once, for a pillow. I'd prefer the Colourshotts if I won because I really like the bright colors there! I subscribe to their newsletter too, thank you for the giveaway! Oh it would not matter which one! I love them both and would make a quilt with Essex linen. I love that look. I follow you in my RSS feed too, thank you again! And I forgot to say what I'd used the prize for if I won, and thats probably because I don't know! I am curious about making a cafe curtain or something for my sunny kitchen window with them! I adore Oakshott fabrics - they're so lovely to sew, either by hand or machine. I don't mind which prize I get (as long as I get one *wink*) so if I'm lucky enough to win please give the other winner their first choice! I love your tiny Lipari stars - they're fabulous! Hi Leanne...thank you for such a wonderful giveaway!! I have never worked with Oakshott fabrics..never, but would love to!! They look fantastic with that sheen you mentioned. But, if I am luckly enough to win...I would be very happy with either that you choose. I've never used Oakshott, but have been lusting over them online recently. I think they'd be a great addition to any quilt--the colors just look so rich and interesting. The colourshotts look gorgeous too, but my first choice would definitely be the Lipiari shot cottons. My budget does not stretch to these beautiful Oakshotts! I can only dream of winning either of these giveaways. Needless to say, I would only look at it until I found THE perfect project! Thanks for the chance to win some Leanne! And, of course I am a follower! The Oakshott 10" pack would be interesting to give a try, having not used Oakshotts before: I have some shot greys I'd be interested to see how the bright colours work against. I haven't tried the Oakshott fabrics but can see how beautiful they are and would like to make some cushions with the fabric. I would happily have either prize. I'd love the FE bundle, because they look so beautiful together. I'd quilt them, probably with some Essex (! ), and no, I've never used them before but I've heard a LOT about them. Thank you! I follow you via Feedly, thanks again! I already receive the Oakshott newsletter. Thanks for this lovely giveaway Leanne. I've used Oakshott before and I'd love to use them again !! I've not used Oakshotts yet but I do have plans to make a table runner and mats set featuring them. I would love to win either prize. I haven't used Oakshotts yet but I want to and I LOVE what you made with them. I do get the newsletter as I am itching to sew with a little bundle of Fat 8 I bought .. they had beautiful fall colors and purple in them, I wanted a runner for the front of the fireplace and didnt get to it. But they are soft so a pillow would be better.. and be out all year. I get their NL, I would prefer the layer cake to go with my stack I own.. I quilt alot with Linen, love it, I even cut up old clothes for that sweet look. I am going to Greece in September, I want some nice linen to wear.. I think I'd go for the Lipari, to use in a throw for our living room. I've never tried Oakshott's before (the price is a bit prohibitive), but I've definitely wanted to try them for a while! thanks so much for a wonderful giveaway - I already subscribe to the Oakshott newsletter ! I follow your blog and instagram too ! I have not used Oakshott before, although I have stalked their shop many times. I desperately want some, but always seem to be able to talk myself out of it when it comes to hitting the purchase button. Hi! 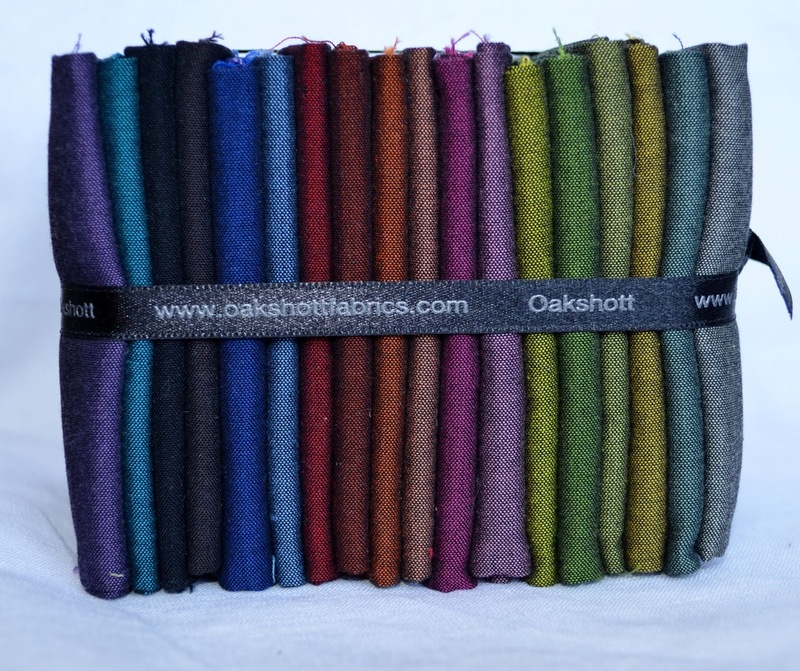 I have never used oakshott cotton but have had my eye on them! I would love either bundle that look beautiful! I would definitely use the in a quilt and maybe some pillows! Thanks for the great giveaway! I just subscribed to the newsletter! Thanks! I follow you via e-mail! Thanks again! I think my first choice would be the Colourshot layer cake. I an idea for pieced triangles in mind and I think the Colourshot line would be perfect. Either prize would be wonderful, I have never used these but I keep hearing how great they are. I think I need to take a look at purchasing some and dreaming up a project worthy of them. I signed up for the Oakshott Newsletter. I'm off to visit the site and see what's on offer! I'm sure I'll find plenty to tempt me!